First McFarlane. Then Diamond Select and Hasbro and Funko. And now finally Mattel gets in on the Walgreens Exclusive game. When the Flash is imprisoned and forced into the service of his enemies, the Atom helps to free him. One of the things that the mostly disappointing Dark Knight Strikes Again did well was the reintroduction of the heroes. Dark Knight Returns established that everyone except Superman had gone into retirement, but the appearance of Green Arrow made it clear that said "retirement" wasn't always a willing choice; do you really think, out of the entire Justice League, that Batman would be the only one willing to carry on? Of course not. In fact, as Strikes Again goes on, it really begins to look like Bruce is the only one who bowed out without a fight. While Bruce settled down to a life of crashing expensive race cars, everybody he'd used to work with had to be forced out of the picture. For instance: the Flash of DK2 (as its covers officially abbreviated it) is Barry Allen, years before he was brought back to life and shoved down everybody's throats in the main books. He was coerced, via threats to his wife Iris, into running in a giant hamster wheel and providing electricity all the way from the Atlantic to the midwest. When he was rescued by Carrie Kelly, she brought him a new costume, explaining that the old one was, well, old. And out of fashion. ("Kids these days. Can't tell the differencee between plain old and classic.") The new one is black, with short sleeves and pants that leave his arms and legs bare. It's an unusual look, but it befits a runner - you don't often see marathoners covering every inch of skin, do you? 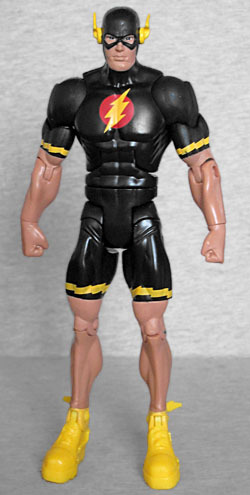 It has a traditional Flash insignia on the chest, a yellow lightning bolt on a red circle, and there are yellow bolts around the biceps and thighs, too, just above the ends of the costume. Instead of boots, he wears big chunky yellow sneakers, with thick soles and three-dimensional lightning bolts sticking straight back off the heel. Those shoes, unfortunately, are the only new mold on the toy, underscoring its major problem: all the other DKR figures have been made on unique bodies, but ones done to the MotU Classics scale. 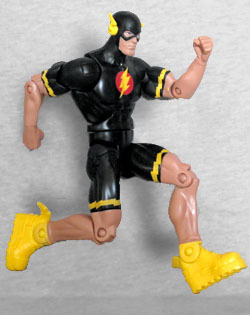 Yes, Flash in the story was a slender guy, not the chunky kind of lumps Batman or Superman were, using the existing DCUC molds makes him too small to fit, aesthetically, with the rest of the line. He ends up looking like a custom you made yourself. Since this is a body released dozens and dozens of times before, you know exactly what to expect from the articulation: hinged ankles, hinged knees, swivel thighs, H-hips, a swivel waist, hinged torso, swivel wrists, hinged elbows, swivel thighs, swivel/hinge shoulders, and a balljointed head that only moves like a swivel. 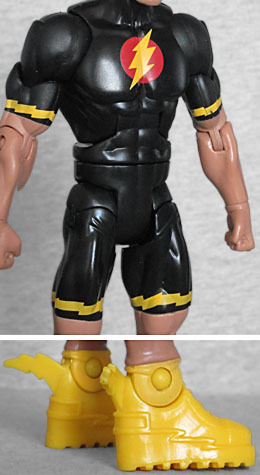 How did Mattel ever think they'd be able to compete with Hasbro with joints like this? To be fair, this amount works for Flash: Frank Miller never really showed him moving; he'd just appear or disappear as needed, blipping in and out, so if all he does is stand around? That's all he did in the comic, too. The bio mentioned Atom because this release includes the Atom. It's just a small unarticulated figure, standing a little over 1½" tall, but it's not something Mattel had made before - none of their prior Atoms came with any such thing, at least. 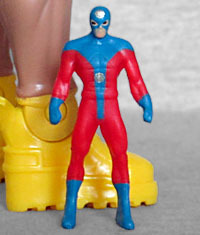 Not sure where this costume came from, though: when Atom comes back on the scene, he's wearing the same costume he always wore, not the version seen on this toy. We also get a piece of this series' Buil-- waitaminnit! There's no Build-A-Figure in this series! So why does Flash include a giant human head? Why, it's an unmasked Bruce Wayne head, perfect for using with either the regular or armored Batmen! Those figures' heads don't come off easily, but if you do, this grizzled old man noggin can pop on there in their place. The size of it really highlights the size disparity between Flash and all the other figures, though. Actually, when we posted the review of the Armored DKR Batman, it talked about how an unmasked head would have been a good accessory, and a reader wrote in to say that one was coming with this exclusive, so that wasn't much of a surprise. No, the real shocker was on the back of the box, where it shows all the other Dark Knight Returns figures - including a Wonder Woman?! Surprise surprise surprise! DK2 Flash is a pefect representation of the book he's drawn from, in that he's an interesting idea that you may have been looking forward to, but the execution fails to live up to the expectations set by what was done before.